A great life balances work with family, serious with playful, adventure with serenity. To imagine a life in balance, visualize an old-fashioned balance scale, with opposites weighed against each other. When living a life in balance, one indulges in the occasional hot fudge sundae, but balanced with a few bowls of oatmeal and small portions. The occasional hard run balanced with an afternoon sprawled in front of the television football game. An afternoon at the bungee-jump or zip-line balanced with time drifting on a placid lake. Rather than the constant grayness of moderation, a life in balance has points of interest and variability. One of the crucial areas of balance is work-life balance - the balance between a career, with its satisfaction of creativity and financial reward, and family life with its reward of love and service. 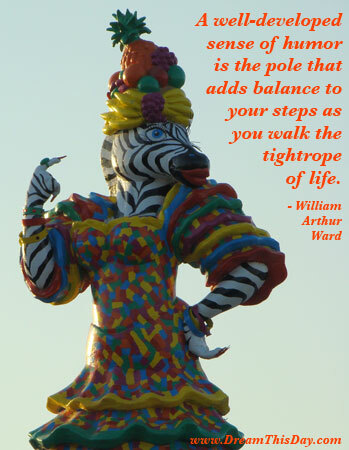 adds balance to your steps as you walk the tightrope of life. Please sign up for my Free Daily Email of Inspirational Quotes and Insights on the form below. I know why families were created with all their imperfections. They humanize you. They are made to make you forget yourself occasionally, so that the beautiful balance of life is not destroyed. with completing the obligations that your labor and tasks require of you. with renewing your vitality by play and celebration. Your informed, "no," to a particular service allows another to offer their gifted and unreserved, "yes." What is the best balance between comfortable habit and skeptical questioning, between following community traditions and independent thinking, between acceptance and crusading for change? Play as often as you can Work as smart as you are able. Our lives are defined not by the challenges we encounter, but by how we respond to those challenges. It's a paradox. How does one balance living in the now with preparing responsibly for the future? The key to this dilemma lies in the distinction between "worrying about the future," and "preparing for the future." The two concepts are not at all the same. Listen to the compass of your heart. All you need lies within you. We disrespect ourselves and our free-will whenever we say that we "need to do" something. Life is always lived in the eye-of-the-storm. Take action as circumstances require, but never surrender your inner peace. To say "too busy" is merely to say "confused priorities."